Who are those lil' scamps gonna fight next? There's gonna be a lot of hootin', a lot of hollerin', and a lot of smack-down-drag-out fightin' this weekend. The Co-Opticrew must have built up a lot of anger in the last week, cause we're either chasing battles, chasing monsters, or chasing sourcerors over the next couple days. I suppose it's good to a let a little rage out every now and then, as long as it doesn't end in someone getting fired cause they "smashed every fax machine in the tri-county area". Or, you know, whatever. Nick Puleo (@NickPuleo) - "State of Decay 2. If time probably some Battletech, Destiny 2, or more Fortnite." Jason Love (@JLove55) - "More Destiny 2 and checking out the Dauntless Open Beta. Possible a little Battle Chasers: Nightwar on the Switch, too." Mike Katsufrakis (@Pheriannath) - "Probably a lot of Dauntless." Eric Murphy (@smurph_em) - "We'll probably play Nine Parchments again for our stream tonight. We're just having too much fun blowing each other up to quit now... I mean blowing up the bad guys. Who would blow up their friends? Silly me." 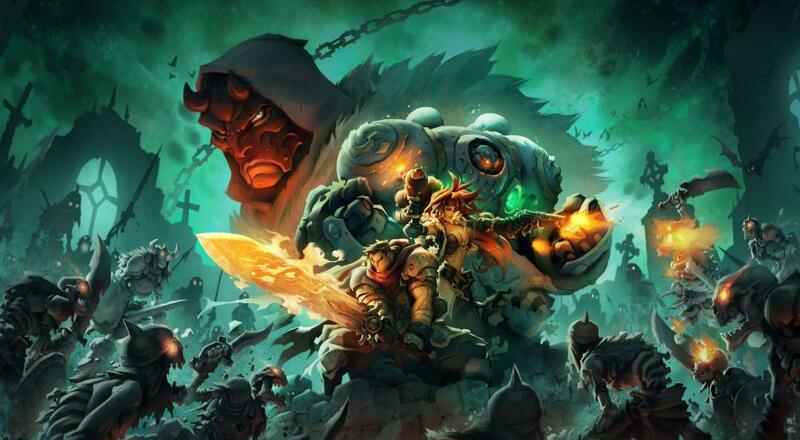 Marc Allie (@DjinniMan) - "On the road, so Switch gaming for me: Battle Chasers." Locke Vincent (@LockeVincent) - "We are hitting the tabletop with 7th Continent this weekend as it finally was released. More BattleTech and Wizard of Legend." Tally Callahan - "Smite and maybe some games on the table." Enoch Starnes (@enochstarnes) - "I'll have a busy weekend taking care of stuff around the house, so maybe I'll escape from reality with that new House Flipper game I keep hearing about." Matthew Squaire (@mattaghetti) - "God of War and Divinity Original Sin when I can play any of the vidayo gamez." So, how about you? Anything good happening during your weekend? Let us know in the comments! Page created in 0.6195 seconds.